Autodesk Meshmixer is software for working with 3D meshes developed by the Design and Fabrication group at Autodesk Research. This app will clean up your 3D scans, fix or transform your model, and prepare it for 3D printing. It is no secret that Meshmixer is being increasingly used by the medical community to create custom prosthetics, orthotics and dental models, to visualize and to print patient-specific internal organs, blood vessels, bones or tumors based on medical imaging data. Doctors can now train and plan for complicated surgical procedures, and patients can now see and understand what’s planned for their needs. I’ve been Meshmixer Product Manager since 2016, and now I am publishing a mini-series of stories from surgeons, doctors, and medical researchers about how Meshmixer helps to save lives. 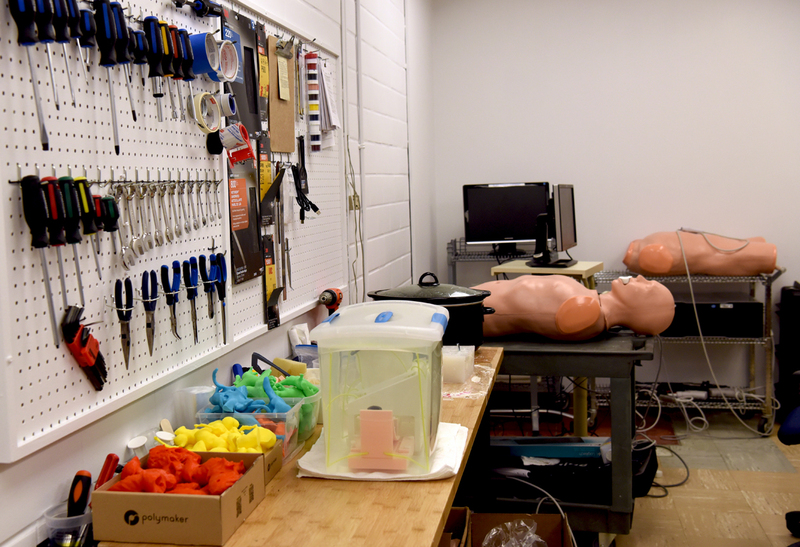 Today I’m talking with Joshua Qua Hiansen, biomedical/industrial designer at The Lynn & Arnold Irwin Advanced Perioperative Lab (APIL) at the Toronto General Hospital, who coined the term ‘Point of Care Manufacturing’ to describe the work they do. RS: Josh, can you please tell us about your lab? 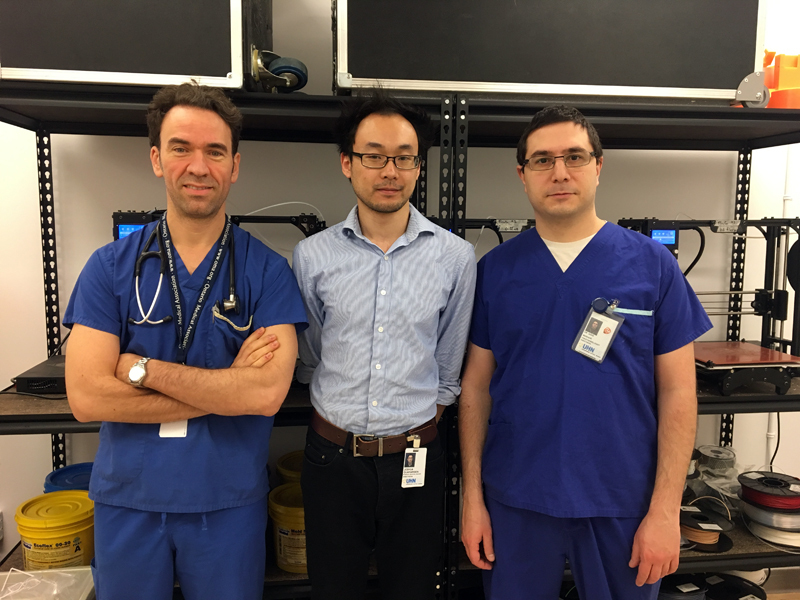 Joshua Qua Hiansen: APIL is a research laboratory in Toronto General Hospital led by Dr. Massimiliano Meineri and Dr. Azad Mashari, both cardiac anesthesiologists at Toronto General’s Department of Anesthesia and Pain Management. APIL specializes in the research and development of patient-specific training phantoms and pre-surgical planning models. 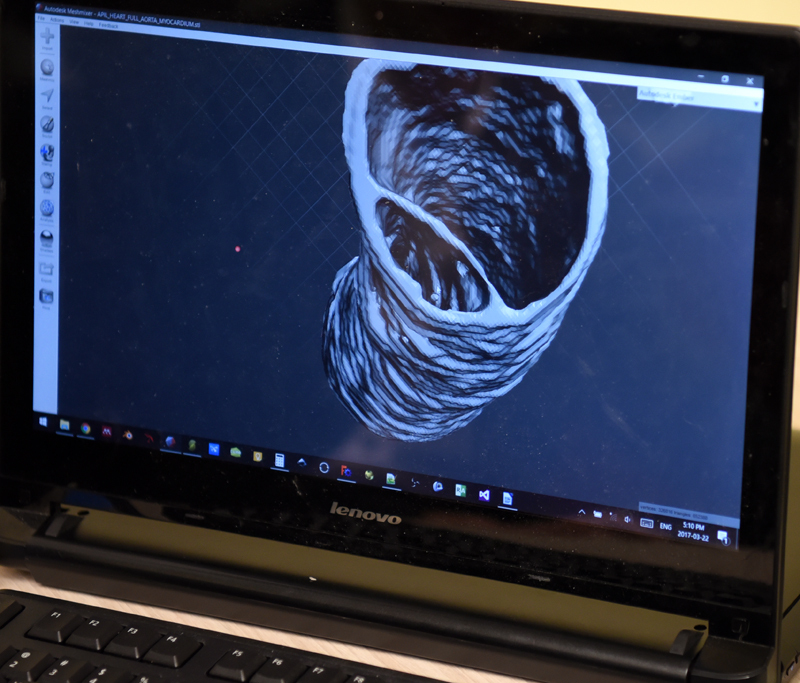 While the majority of our work is focused on cardiac applications, such as patient-specific hearts and heart valves, we have also developed spine neuraxial training models and airway bronchoscopy simulators as well. RS: How long has the lab existed? Joshua Qua Hiansen: APIL has been at Toronto General for a little over a year now. RS: Wow, it is so new! So, how many patients have benefited from its services? Why is your work so important? Joshua Qua Hiansen: As of March 2017, we have been involved in the development of eight patient-specific models for pre-surgical planning operations with six of the models being requested in the past four months. Interest in our services to produce these 3D models for pre-surgical planning has recently increased and we believe this trend will continue. With that said, our lab has also produced a wide range of patient-specific educational models for student/trainee courses. These models range in variety from anatomic demonstrations of specific ultrasound slice planes, flexible bronchoscopy simulators, spine ultrasound-guided needle insertion simulators, fully echogenic heart phantoms and more. Several of these educational trainers are currently being evaluated for their efficacy and some are currently in use within the Department of Anesthesia and Pain Management at Toronto General Hospital to demonstrate ultrasound and anesthesiology concepts to medical residents. RS: How does having a 3D printed model help the surgeon? Joshua Qua Hiansen: The 3D printed models give the surgeon a better understanding of the patient’s particular anatomy. Sometimes with complex pathological conditions where ‘regular’ anatomy is augmented, it may be difficult to interpret the images based on just 2D medical imaging modalities. By giving clinicians a digital 3D model or a 3D printed replica of the patient’s anatomy, they are able to more accurately assess spatial associations of a specific pathophysiology. Also, the 3D printed organs allow surgeons to understand whether certain defects, such as holes, can be repaired via resection. 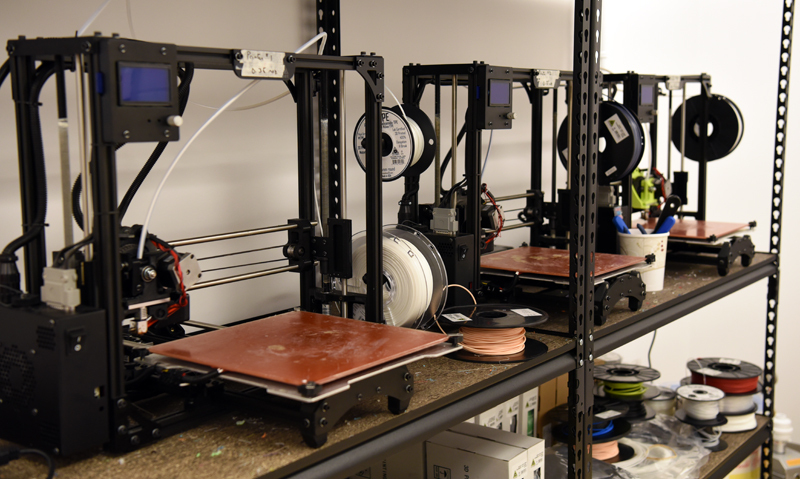 Furthermore, the 3D printed organ can be used to test and select the best plug/occluding device for the patient before the surgery has even started. RS: And what do patients get out of this? Joshua Qua Hiansen: For the patient, the 3D models help to facilitate understanding of the intricacies of their specific physiology and pathology. Additionally, doctors can use the models to more thoroughly, and more clearly, explain the nuances of specific interventions to the patient and their family ahead of time. These facets help to keep the patient, and their family, well informed throughout the course of care, and facilitates better communication between clinical teams and their patients. RS: And where does Meshmixer come into your workflow? Joshua Qua Hiansen: APIL produces a wide range of organs and devices. To do so requires a myriad of software suites to accomplish specific goals from organ segmentation to slicing for 3D printing. Tying all of our modelling and printing software workflows together is Meshmixer. 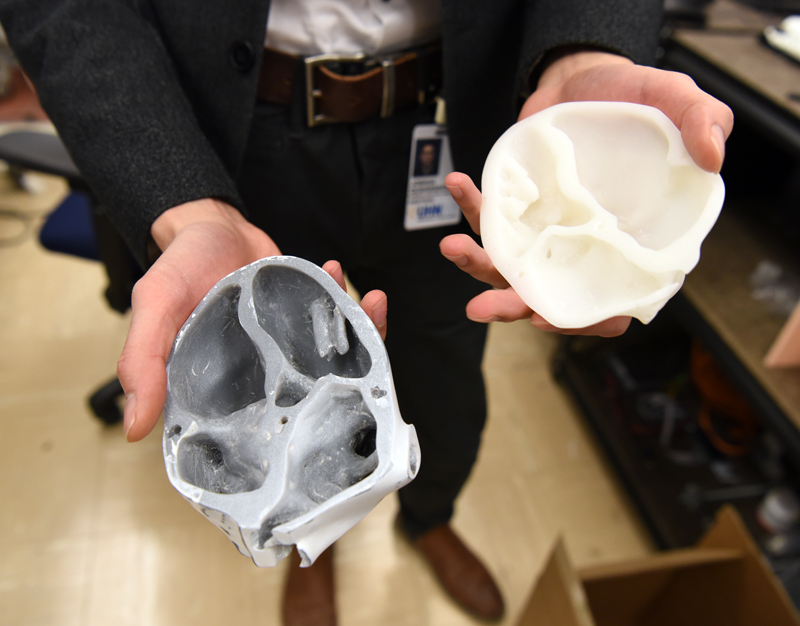 Regardless of whether we are producing a full patient heart with a complex congenital defect for pre-surgical planning, or a custom-built tool for basic science research, our models are always imported into Meshmixer prior to slicing for 3D printing or 3D model texturing. At the most basic level, all of our 3D models are first imported into Meshmixer in order to identify any defects. Inverse faces, unconnected polygons, non-manifold regions and the like are highlighted and usually repaired easily by Meshmixer’s inspector tool. Doing so ensures that the models will be printed properly. Many times during cardiac model creation, we find that the triangle count may be anywhere between 500,000 - 1 million. Attempting to edit and repair models of this size is taxing on our workstations and slows down our workflow considerably. With Meshmixer, we reduce the number of triangles while still maintaining accurate overall geometry of our prints. Not only does this reduce the computational load on our systems, but it reduces the file size as well. RS: Is there a functionality of Meshmixer you use most often? Joshua Qua Hiansen: Our patient-specific organ models are created from computed tomography (CT), magnetic resonance imaging (MRI) or 3D echocardiographic imaging sources. As a result, the segmented 3D model will have a ‘stepped’ effect due to the slice thickness of these imaging technologies. In order to improve the surface quality of our models, we will typically apply a light surface smoothing deformation operation which removes these aberrations. For more precise operations where we need to smooth out certain details and specific regions, we’ll use Meshmixer’s ShrinkSmooth and BubbleSmooth sculpting brushes. While we utilize the majority of tools within Meshmixer, two of the most useful for our applications are the Offset and Plane Cut tools. For example, the Offset tool allows us to rapidly approximate the thickness of the cartilage around the trachea which would be otherwise difficult, if not impossible, to see on CT/MRI. Lastly, the Plane Cut tool allows us to create very accurate slice planes along the heart which correspond to different standard ultrasound views. This technique has been successfully used to create a set of 3D printed hearts sliced at specific angles to demonstrate key cardiac ultrasound views for resident training. RS: This might sound cheesy but how long does it take to repair a ‘broken’ heart? 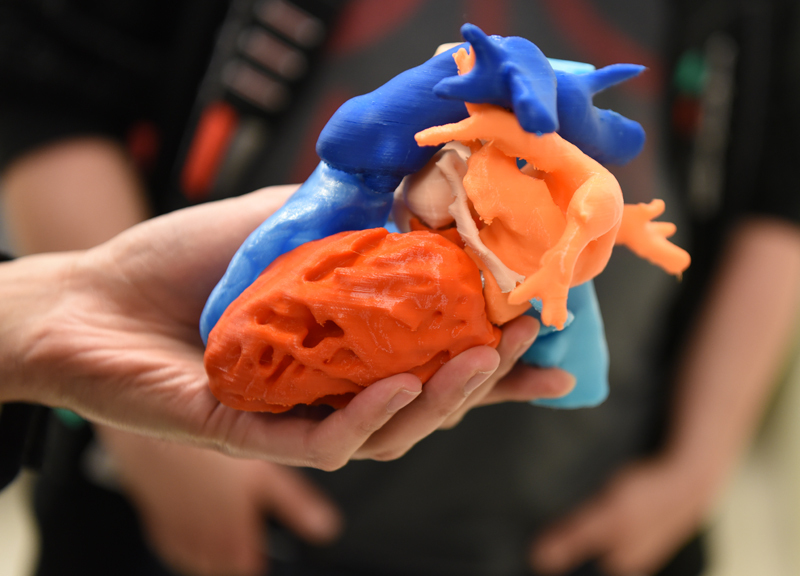 Joshua Qua Hiansen: The time to prepare a patient’s heart from medical imaging data to a 3D printable model depends on the physiological complexity, resolution and contrast of the base medical imaging data, and which parts of the heart we are interest in producing. If we need to produce a full, patient specific heart it will typically take anywhere between 12 - 20 hours to create an accurate, completely 3D printable model. The majority of the time is spent performing segmentation: the process by which we identify the relevant features of a patient’s heart from medical imaging data, slice-by-slice, and reassemble the data into one solid, 3D model. We then take the segmented 3D model and import it into Meshmixer for post-processing: triangle count reduction, surface re-meshing, mesh defect repairs, and a light surface smoothing to counteract the stepped effect from medical imaging data. This workflow inside Meshmixer is quite efficient and allows us to post-process a patient-specific heart in approximately an hour. RS: Josh, I can see you’re printing in ballistic gel and multi-material. How do you do it and why? Joshua Qua Hiansen: The production of our ballistic gel based echocardiography phantoms requires a long and technical methodology to produce. The full details will be published soon in a technical manuscript the lab is currently editing and finalizing before initial submission to a peer reviewed scientific journal. In brief, the production of a ballistic gel phantom starts with our normal process. We then slice the 3D print for fabrication using a high temperature resistant filament on a desktop FDM 3D printer and print the model hollow. The printed model is then submerged into a vat of liquefied ballistic gel at a very high temperature. 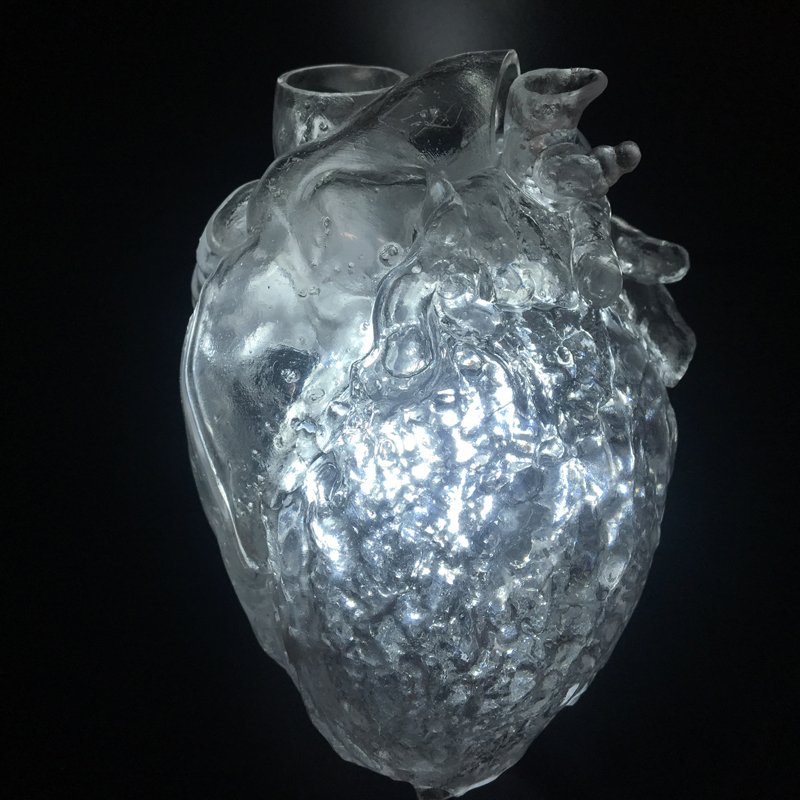 Once the gel has cooled and solidified, the 3D printed shell of the heart is stripped away leaving only the soft, tissue-like and echogenic ballistic gel heart with all of the chambers, cardiac valves and great vessels preserved. RS: What IS point-of-care manufacturing? 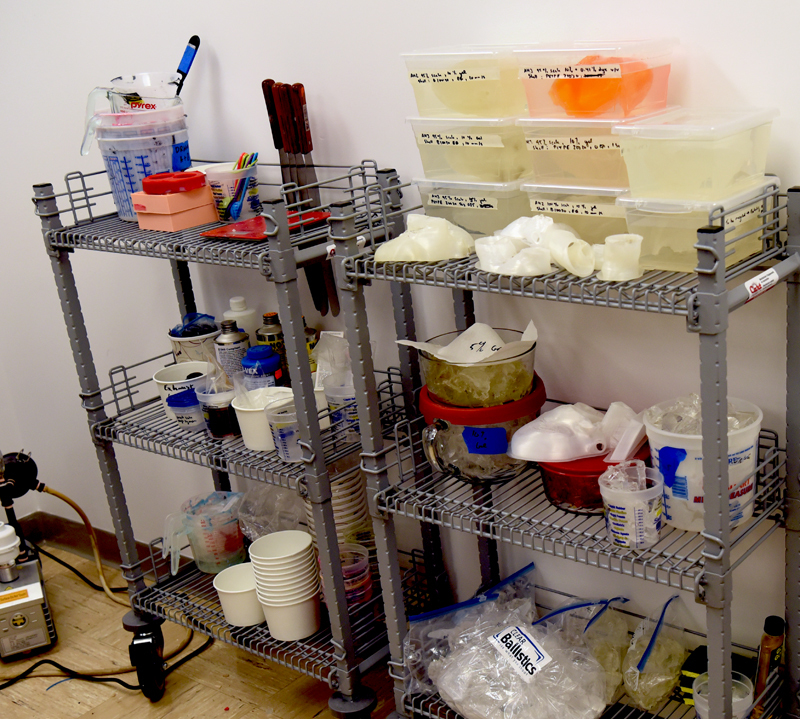 Joshua Qua Hiansen: It’s a concept of an in-hospital fabrication service to produce patient-specific models and devices to enhance clinical care. RS: Thank you for letting us know about your work and for healing our hearts! Dr. Massimiliano Meineri is a Staff Anesthesiologist at Toronto General Hospital, an associate Professor of Anesthesia at the University of Toronto and Director of both Perioperative Echocardiography and APIL. He is engaged in research areas ranging from 3D TEE, online simulations, point of care ultrasound and 3D modelling/printing for medicine. In his rare off-time, Dr. Meineri enjoys running, cycling, skiing and sailing. Dr. Azad Mashari is a Staff Anesthesiologist at Toronto General Hospital, Lecturer in Anesthesia at the University of Toronto and is the Director of Education at APIL. His main areas of research interest include point of care ultrasound and echocardiography, and the educational/clinical applications of 3D imaging, modelling and printing. Joshua Qua Hiansen is APIL’s Biomedical/Industrial Designer. He manages the lab’s day-to-day activities, and is primarily responsible for the development of new fabrication techniques and digital workflows. His latest research focus is on the idea of point-of-care manufacturing: the concept of an in-hospital fabrication service to produce patient-specific models and devices to enhance clinical care.